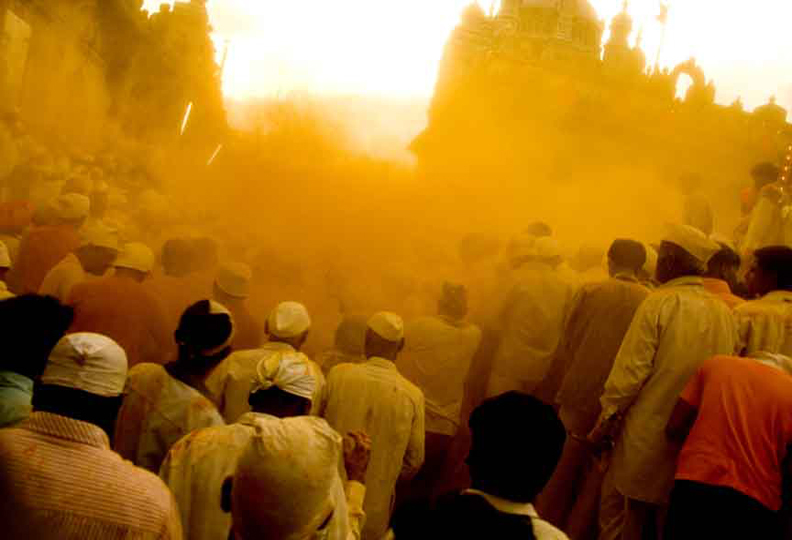 Throwing great clouds of an offering of turmeric powder called bhandara into the air, the pilgrims paint the town golden yellow, a color they associate with the power of the sun and one suggestive of Khandoba's solar origin. 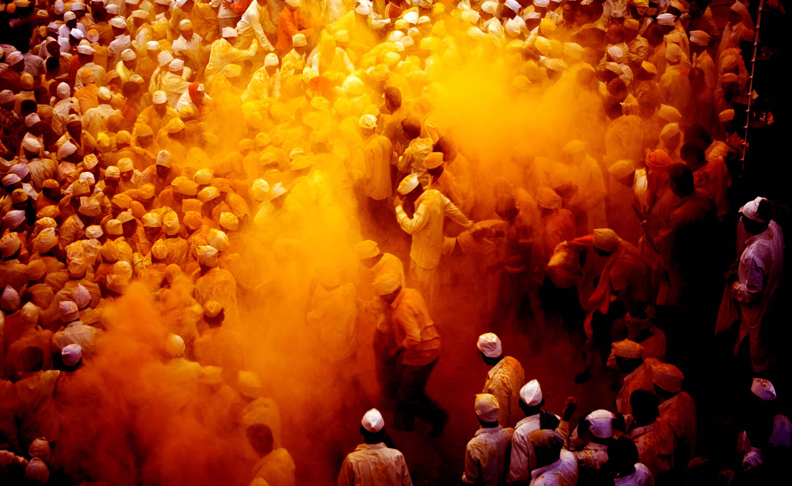 Shouts of the ritual slogan Sadanandacha Yelkot and Yelkot Yelkot Jai Malhar acclaim Khandoba's everlasting bliss. 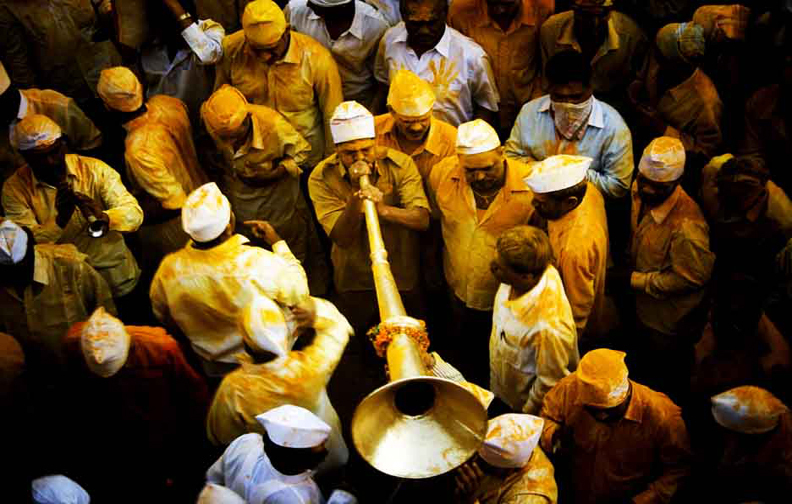 Understandably the pilgrims refer to the town as Sonyache Jejuri, or Golden Jejuri. 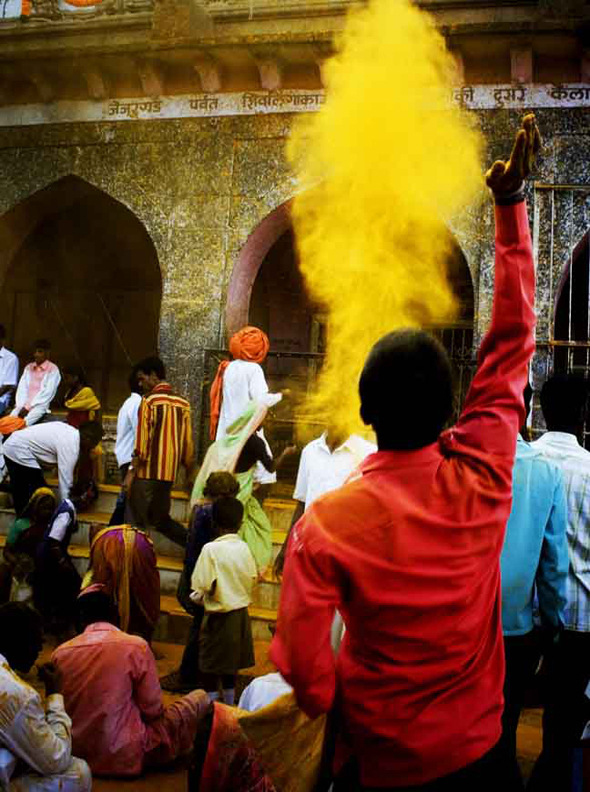 Khandoba, also known as Khanderao, Khanderaya, Malhari Martand and Mallu Khan is a regional Hindu deity, worshipped as MÄ�rtanda Bhairava, a form of Shiva, mainly in the Deccan plateau of India. 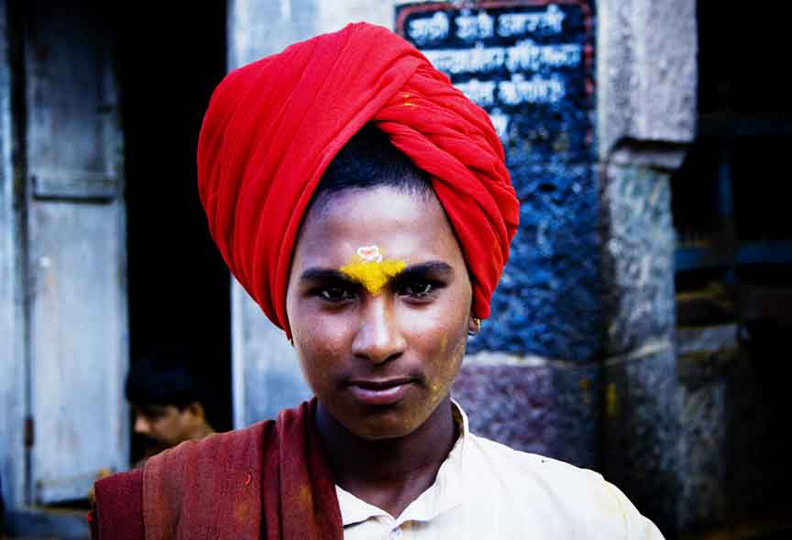 He is the most popular family deity in Maharashtra. 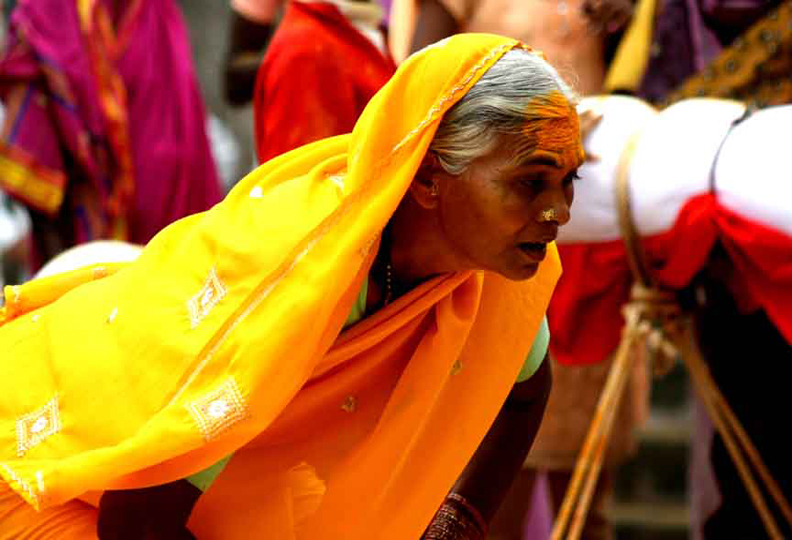 A six-day festival, from the first to sixth lunar day of the bright fortnight of the Hindu month of Margashirsha, in honour of Khandoba is celebrated at Jejuri Temple. 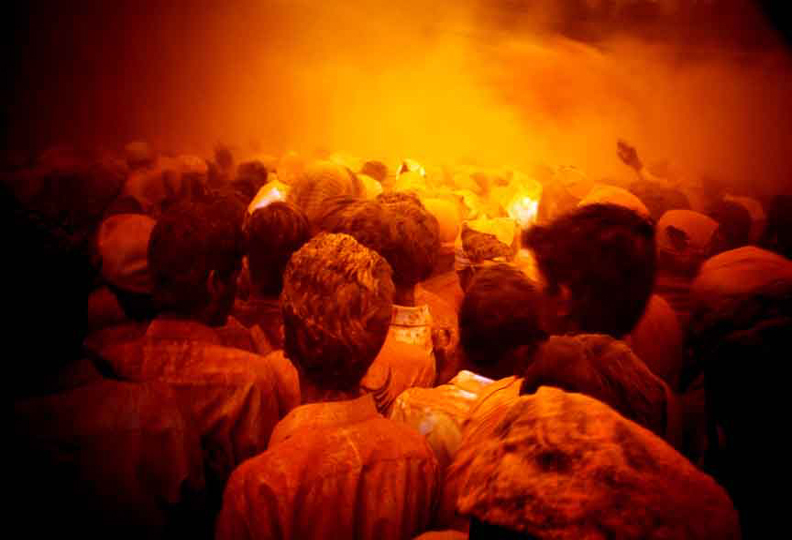 A jatra is held in Pember on Champa-Shashthi, and the festival continues until Purnima (New Moon Day, A palakhi (palanquin) procession of Khandoba and Mhalsa's images is carried from the Gad-kot temple to the Karha River, where the images are ritually bathed. 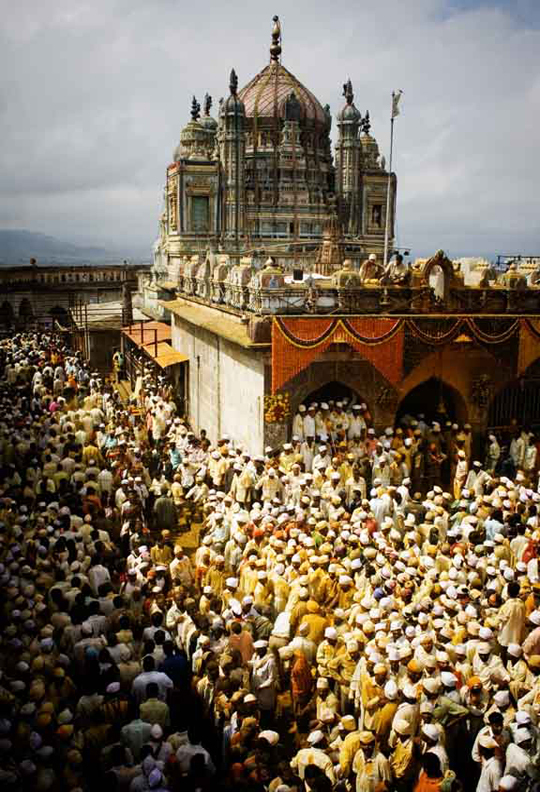 Thousands of pilgrims, devoted to Khandoba have come to Jejuri temple to celebrate the Festival. 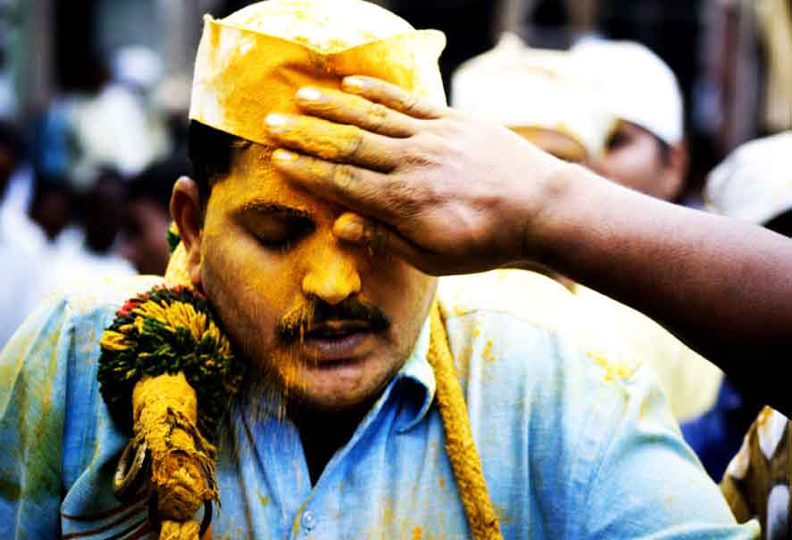 During the festival, turmeric powder (haldi) is offered to the Lord Khandoba.Almost all visitors carry small packets of haldi and offer it to every deity from mahadwara to the archamurti Lord Khandoba. 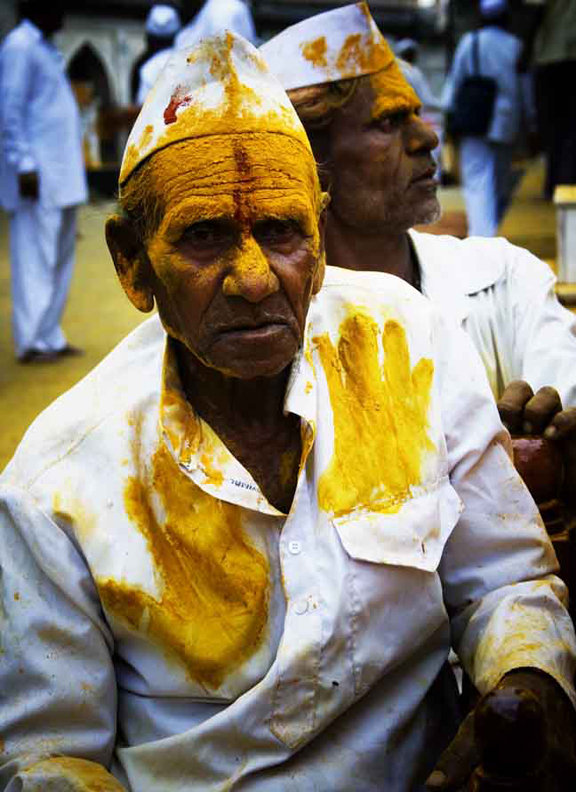 The riches and mandaps built for several parivaradevaths are receiving haldi offering with utmost satisfaction. 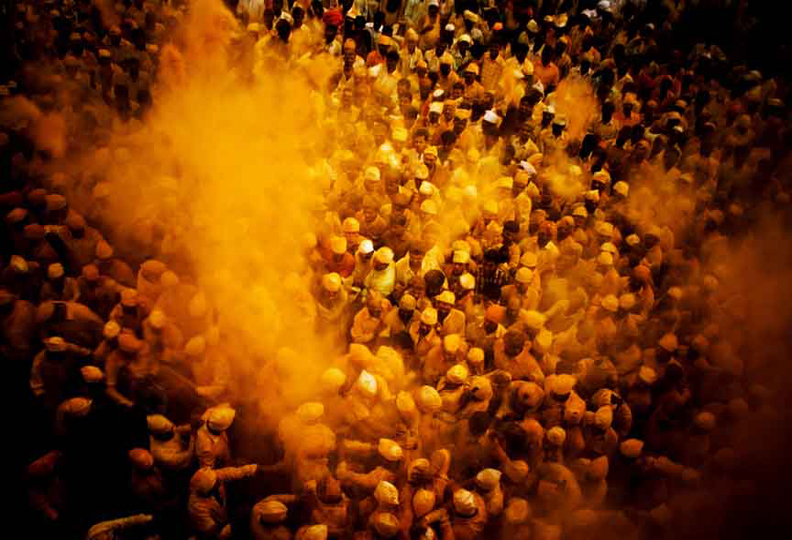 As every one takes and offers, the whole ground appears like a yellow sheet. 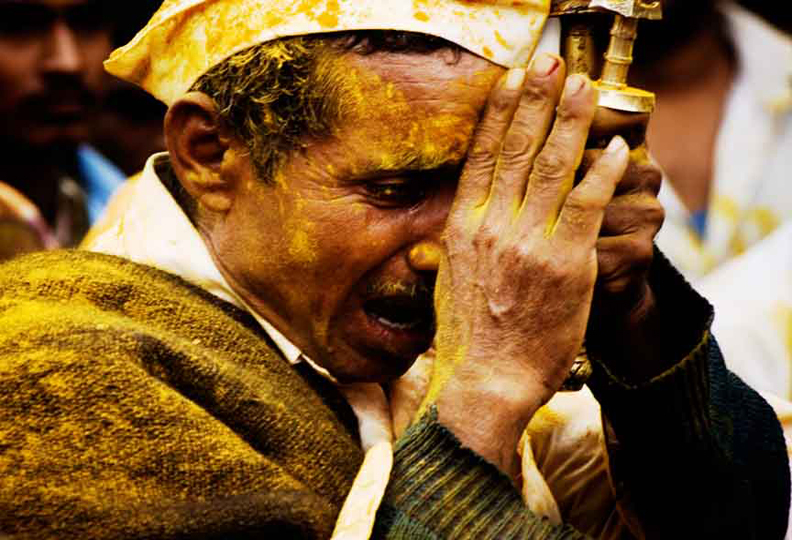 Regular worship goes on round the year with haldi offering mainly. 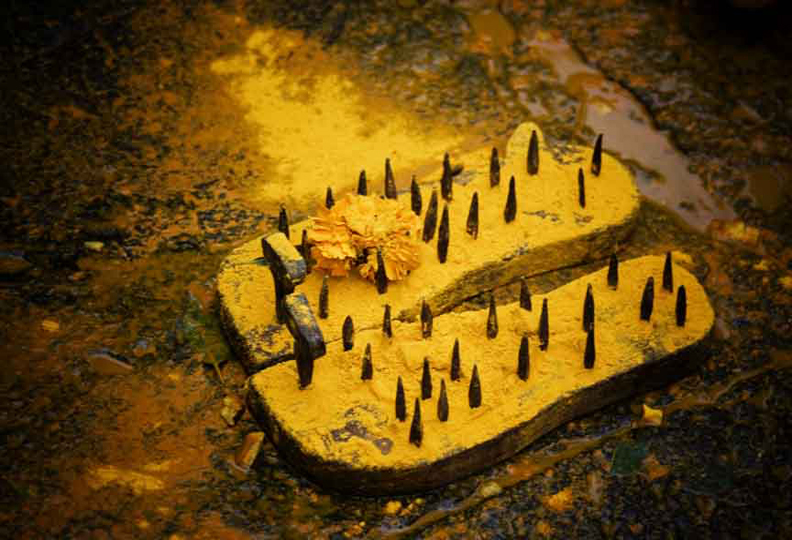 During the Bhandara festival,Devotees Perform various self-inflicted Religious Rituals, It ranges from mortification of the flesh, barefoot pilgrimages, piercing the body, walking on their knees, as an act of devotion or penance. 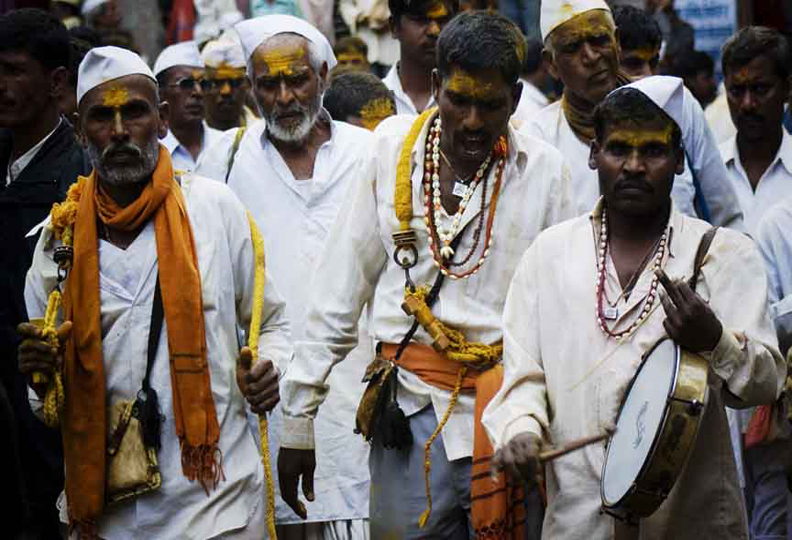 Devotees called this form Bhakti (Devotion) as Ugra (violent, demonic). 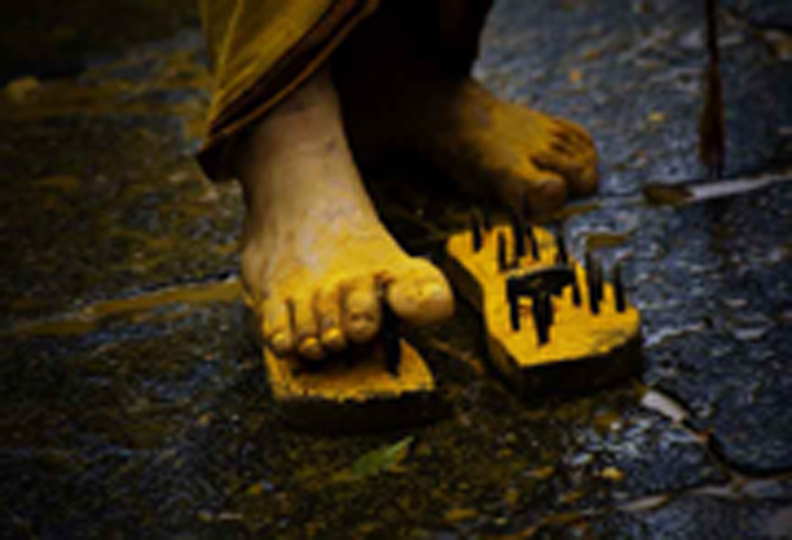 By publicly practicing self-torture and, above all, by coming out of it unharmed, the Devotees shows everybody that the divine entity that is believed to descend upon him during the possession or the trance, has the faculty to make him insensitive to the stimuli of pain. 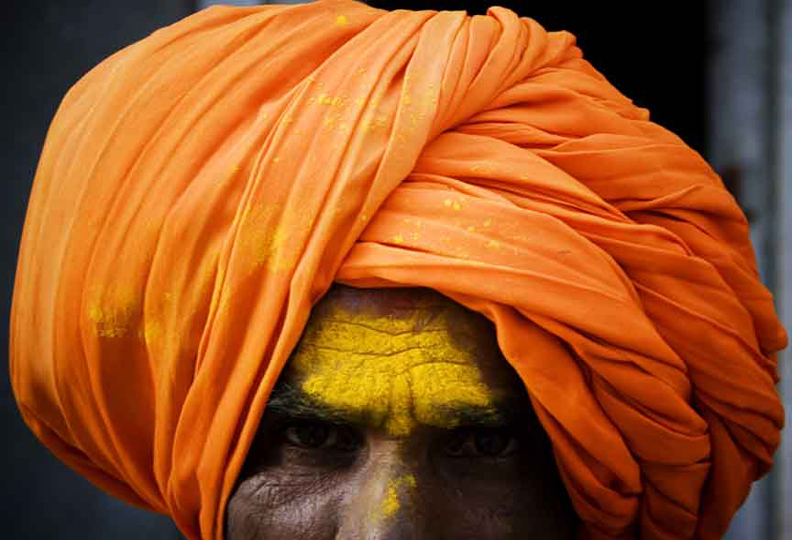 Religious observance suggests that it has two main purposes. 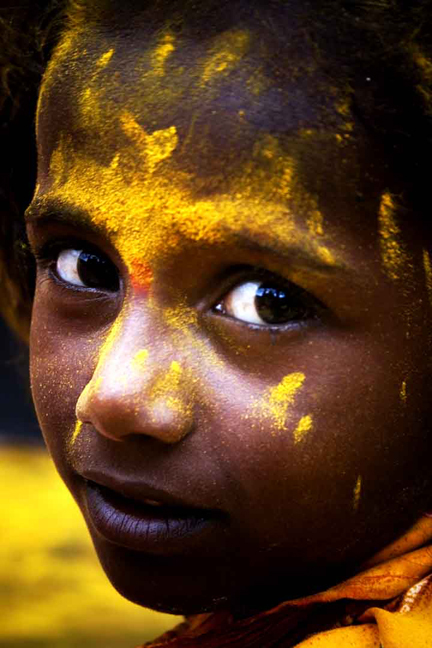 One is the hope of rooting out some physical appetite, thereby achieving purity and self-mastery, and thus merit. The other, much the main purpose, is to induce an ecstatic or transcendent state often interpreted by believers as contact with the divine.